Amel Saleh (No. 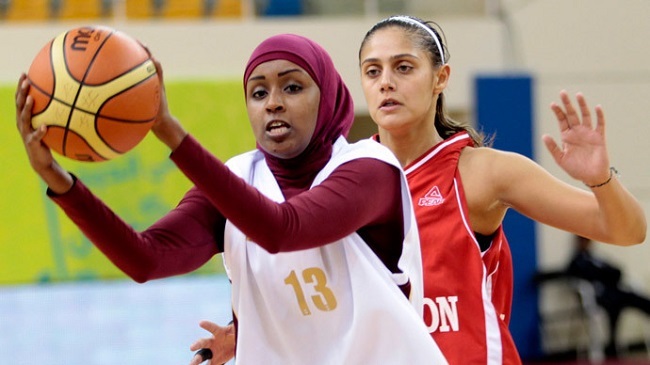 13) of the Qatari women’s national basketball team. Back in 2014, thanks to a surge of public pressure largely generated by social media and celebrity supporters like WNBA star Breanna Stewart, NBA player Kenneth Faried (who is Muslim) and U.S. Olympic fencer Ibtihaj Muhammad (who is Muslim and competed in the Olympics while wearing hijab), FIBA began a two-year study and testing phase on Article 4.4.2, allowing the prohibited headgear in some competitions. It’s tough to imagine that if this rule was more closely associated with another marginalized group other than Muslim women, it wouldn’t have been lifted long ago. Or perhaps it never would’ve landed in the pages of the FIBA rulebook in the first place.